Do you hate making small talk? Do you wish you could walk up to anyone, anywhere, anytime, and just start talking to them? 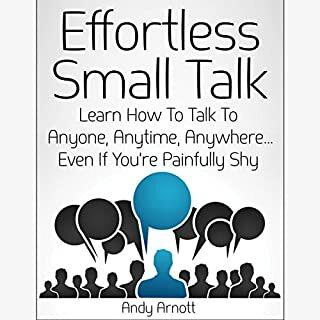 Well, it isn't difficult.… In this book I detail everything I've used to overcome my fear and inability of making small talk so that you can, too. You can pick up this book, listen to it, and have an actionable step-by-step structure to follow so you can master small talk. Everything in this book has been boiled down to its simplest form and then molded into actionable steps. Alright book for the price. But mostly about acknowledging that you have social anxiety and just push through it by being a good listener and asking open ended questiins. Wished for more techniques and secret tips on small talk. Narrator was a little robotic too.